This is an application of dual 7" 3RU rack monitors with IPS screens, viewing SD, HD and 3G-SDI video. This product employs new integrate circuits and high quality LCD modules. It is putting out with its low power consumption, emits no radiation, and other advantage characteristics. This product is shaped with modern style and is easy to be carried with. 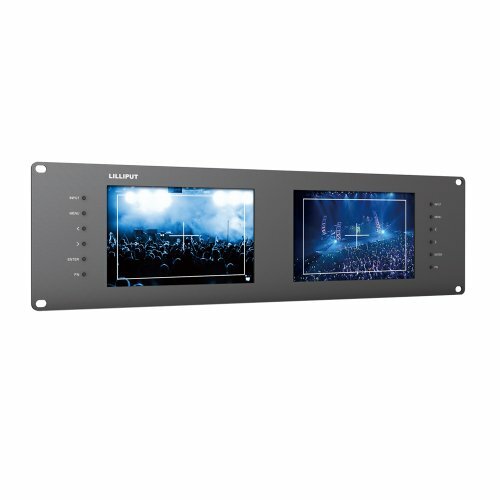 Lilliput 7" 3RU rack monitors are the best solution for high quality SDI monitoring! They have a various use for broadcast, on-site monitoring and live broadcast van, etc. As well as setup a video wall of rack monitors, a rack for a customized monitoring solution also can be supported for viewing images from different angles. Because of better filtering and scaling advantages, Lilliput's 3RU rack monitors are really suitable for broadcast quality monitoring system. With high quality SD, HD & 3G-SDI inputs, precise color can be controlled under multiple displays conveniently. Tally port is ideal for large broadcast systems. If you have any questions about this product by LILLIPUT, contact us by completing and submitting the form below. If you are looking for a specif part number, please include it with your message.